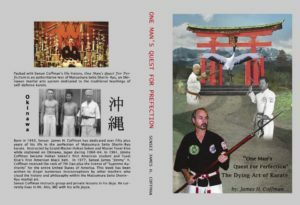 “One Man’s Quest for Perfection” is Sensei James “Jimmy” H. Coffman‘s first book about his real-life history with the SHORIN-RYU MATSUMURA ORTHODOX (SEITO) which is a style of martial arts from the Island of Okinawa taught by his two teachers Sensei Kise Fusei and O’ Sensei Hohan Soken. With this informative book comes a DVD packed with actions. 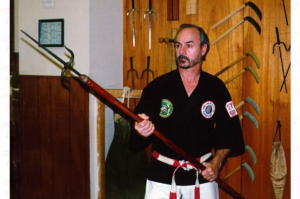 Sensei Coffman believes in one rule and lives by it: “The way you train is the way you will carry yourself in a fight out there. If you don’t experience pain in your training nor deliver pain to your opponent, you will never learn the True Essence of Martial Arts”. This book is a “Must Read“. 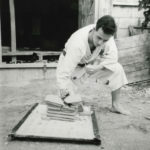 Rick Turnpaugh: ” Any one interested in real karate as was taught pre 1965, before karate became an after shave, video game, or watered down for kids use, exploited, exported & commercialized… I urge you to pick up a copy of Sensei James Coffman’s book “ONE MAN’S QUEST FOR PERFECTION, THE DYING ART OF KARATE”. Mr. Coffman pulls no punches in telling of his karate training in Okinawa under Sensei Kise and Master Soken in the early 1960s. 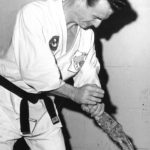 A very informative look at Shorin ryu karate training as it was taught to a few Americans before it became sport oriented, a time when ones life may depend on wether your karate training was realistic or not! 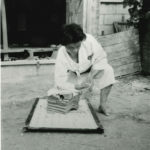 In his book Coffman recalls his introdution to karate, life & death street fights, training methods, and his rare insights gained from seeing & training under several of the last real Okinawan grand masters living in the 20th century. James Quad: “Took your book on vacation with me.. A great read for all martial artists. It really drives home the point that surviving a fight is the primary goal. I’ve three sons. My eldest gets it, he absorbed Shorinji training like a sponge. While in Army Basic Training , he continually frustrated the”Combatives Instructor” with his superior skill level. Nor did he have any trouble with any other opponents, no matter their style. However, my two younger sons, don’t have the same critical focus or dedication. They are reading your book now and your message appears to be sinking in.